AVN441 - H.264 (MPEG-4) HD/SD Video/Audio Encoder with HDMI, DVI-D, Component inputs and IP output | AdvancedDigital Inc. 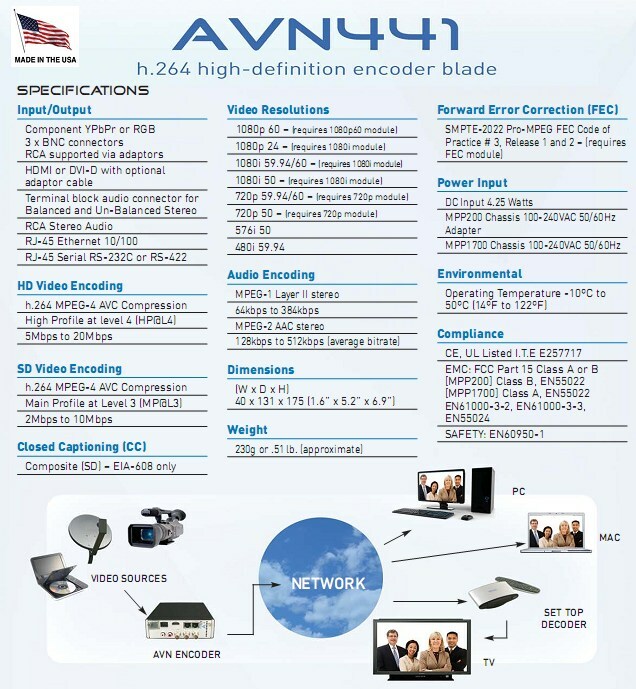 The AVN441 encodes high or standard definition video in an h.264 stream (MPEG-4 Part 10/AVC). It’s used in a Media Processing Platform (MPP200 or MPP1700), a high density rack mount system. Plug a video source directly into the blade, plug into the network via the RJ-45 connection, and stream real-time high or standard definition video over your LAN or WAN. The MPP with AVN441 blades is suitable for all applications requiring cost-effective, low bit rate, high or standard definition video distribution over IP networks. AVN441 IPTV encoders can turn video from HDMI, DVI-D, Component (YPbPr or RGB) sources into full-screen, full resolution Internet Protocol digital video in real time. The AVN441 features modular firmware architecture, which lowers the base price by allowing the user to purchase only those features they need at the moment, while maintaining the flexibility to upgrade in the future as requirements change. The list of optional add-on-modules currently include 720p, 1080i (with 1080p @24 support), 1080p @60, and Forward Error Correction (FEC). h.264 (MPEG-4 Part 10/AVC) hardware compression and Visionary Solutions’ optimized transmission technology provide a high or standard definition, full frame rate, IP video stream. The stream can be viewed by an unlimited number of clients on a LAN or WAN provided that bandwidth is available. Image resolutions are configurable based upon purchased modules. The base model includes 480i SD encoding, with Closed Captioning (CC) support. Optional modules allow FEC support and image resolutions to be configured up to 720p, 1080i (with 1080p @24 support) or full 1080p at 60 frames per second. The total bit rate can be configured from 5 to 20 Mbps for HD and 2 to 10 Mbps for SD. The audio compression is either AAC (128 to 512 kbps audio encoding, average bitrate) or MPEG-1 Layer 2 (64 to 384 kbps audio encoding) with up to 48 kHz sample rate. For superior image quality and reliability in the most demanding network video environments, the AVN441, with optional FEC module, incorporates SMPTE-2022 Pro-MPEG FEC Code of Practice # 3, Release 1 and 2. This allows FEC enabled receivers to monitor the stream and recover missing packets. The AVN441 allows Closed Captioning of SD signals using the Composite input. EIA-608 is supported. The AVN441 includes three BNC connectors for component YPbPr, RGB, or Composite and one HDMI input (DVI-D with optional adaptor cable) for connecting video and audio source equipment. A terminal block connector provides audio inputs for Balanced and Unbalanced connections. This allows for easy onsite connections regardless of the cabling outputs of the audio source. There are also two RCA audio connectors (L/R) which support only unbalanced connections, and the HDMI input carries audio as well. The AVN441 features user control of audio parameters, including mute, pre-amp and volume. The AVN441 includes a serial connection via an RJ-45 connector. This connector can be used as an RS-232 port (full-duplex, no hand shaking) or an RS-422 (full-duplex) port. These ports allow the AVN441 to interface with external devices such as terminal emulation equipment. of the device is accomplished by any of four methods: PackeTV™ Manager (2nd generation), console menus, a Web interface, or the AVN Control Protocol API. TCP/ IP, HTTP and other Internet-related protocols are supported. 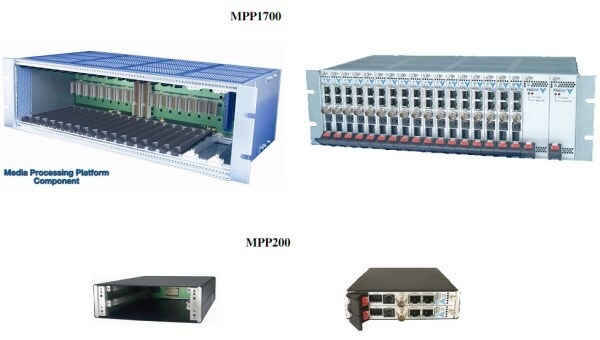 The MPP1700 Multi-slot chassis with power supply module will hold up to eight AVN441. The MPP200 chassis with external power supply can hold one AVN441.